The Alweife Brook constructed wetland stores and gradually releases stormwater. flow, allowing sediment to settle, and removing nutrients and pollutants from the water. Source: The Friends of Alewife Reservation. 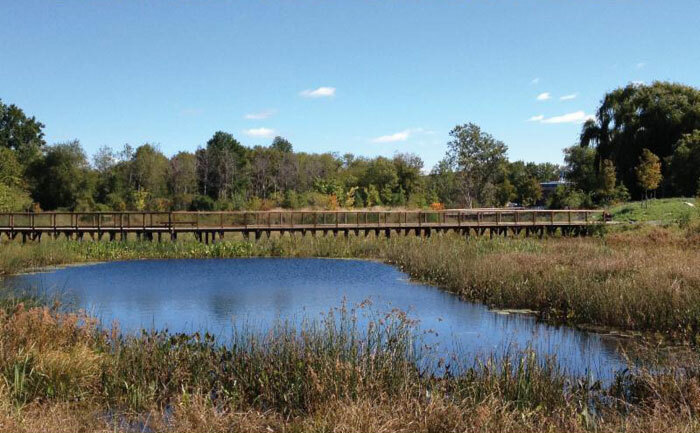 For more info: Alewife Constructed Wetland fact sheet (PDF). CSOs and contaminants that can get into separate stormwater pipes can include bacteria and other pathogens, oxygen-demanding pollutants, solids and other contaminants. 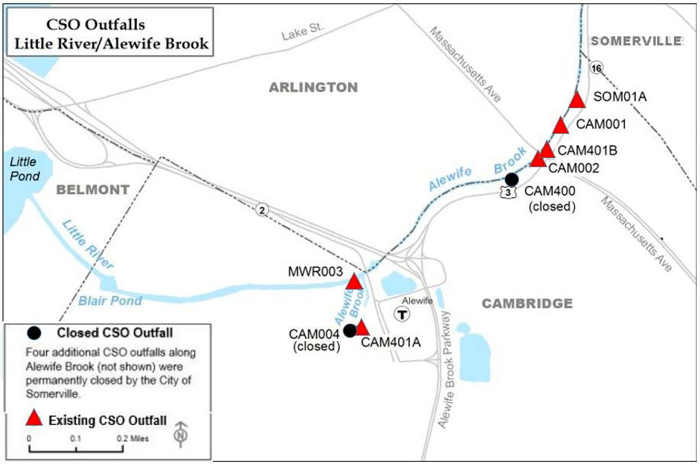 Because of increased health risks associated with these contaminated discharges, public health officials recommend avoiding contact with the Alewife Brook during storm events and for a period of 48 hours following rain storms, as there may be increased health risks during these periods. Contact with floodwaters should also be avoided as they may contain similar contaminants and pose associated health risks. Proper precautions are necessary to minimize these risks during flooding events. DEP has developed guidance for homeowners for responding to flooding onto your property from large storms or sewer backups, which can be found on the DEP website. In December 2015, MWRA, in partnership with its CSO communities, completed the last of the 35 projects in the Long-Term CSO Control Plan approved by the U.S. Environmental Protection Agency (EPA) and DEP and mandated in the federal court order. Seven of the 35 projects have contributed to the control of CSO discharges to the Alewife Brook. Together, the seven projects have closed six CSO outfalls (half of the outfalls that were active in the late 1980s) and are predicted to reduce average annual CSO volume to the Alewife Brook by 85% and reduce the frequency of CSO discharges at the most active outfall from sixty-three (63) activations a year to seven (7) activations a year. Remaining CSO discharges are predicted to comply with Class B “fishable/swimmable” water quality standards 98% of the time. For more information about the Long-Term CSO Control Plan, the projects and their CSO control benefits, and water quality conditions and improvement, see MWRA’s final CSO Annual Progress Report, filed with the Federal Court in March 2016. Since its CSO program began in the mid-1980s, MWRA has effectively met more than 180 federal court schedule milestones related to CSO control. The last two milestones require MWRA to commence a three-year CSO post-construction monitoring program and performance assessment by January 2018 and submit a related report to EPA and DEP by December 2020 intended to verify that remaining CSO discharges meet the levels of control in the approved Long-Term Control Plan and court order. On November 8, 2017, MWRA issued the Notice to Proceed with a contract for post-construction monitoring and performance assessments in advance of and in compliance with the January 2018 milestone. The ongoing contract includes CSO inspections, overflow metering, hydraulic modeling, system performance assessments and water quality assessments, which will be documented in the report to EPA and DEP in December 2020. MWRA published the first of five planned semiannual progress reports on November 30, 2018, a copy of which is posted to MWRA’s website at http://www.mwra.com/cso/pcmapa.html. MWRA plans to publish a second semiannual progress report in April 2019 and hold a public briefing on the CSO performance assessment later in Spring 2019. Since 2000, DEP has issued a series of variances to water quality standards that allow CSO discharges to Alewife Brook and the Upper Mystic River pending completion and verification of MWRA’s Long-Term Control Plan. On August 31, 2016, DEP extended the variance to August 31, 2019. The variance extension and a supporting fact sheet can be found at: http://www.mass.gov/‌eea/‌agencies/‌massdep/‌water/wastewater/final-determinations-for-cso-variances.html. The variance includes conditions requiring MWRA to conduct certain water quality sampling, CSO discharge reporting and proper sewer system operation and maintenance to minimize CSO discharges and their impacts. The current variance extension also required MWRA to submit a modified (enhanced) water quality monitoring program by December 2016 and a scope of work for the three-year post-construction monitoring program and CSO performance assessment by May 1, 2017. MWRA met both requirements and continues to conduct its water quality monitoring program, as modified. MWRA is in discussions with DEP regarding reissuance of the variance beyond 2019. During the next variance period, MWRA will complete its CSO performance assessment in compliance with the court milestone and expects to perform additional CSO and water quality impact assessments that can ultimately support long-term determinations by DEP on water quality standards and related level of CSO control for Alewife Brook and the Upper Mystic River.